Airoma® Therapy & Spa – Drift off with our soothing and sensuous Airoma® Therapy & Spa range. Micro Airoma® fragrances are modern and offer style and impact options to match all preferences. All Micro Airoma® fragrances are complex, unique and long lasting. 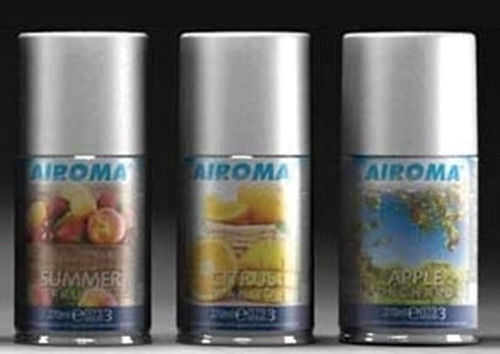 The refills are suitable for use in the Micro Airoma Odour Control Dispenser and other competing micro aerosol air freshener dispensers. Babyface 100ml. A powdery, fresh fragrance which evokes bouncing babies and peachy skins. Jade 100ml. A warm woody scent charged with citrus and various fruits and herbs. Powerful and revitalising. Pearl 100ml. A clean fresh scent combining pink grapefruit, musk and yellow rose, to capture purity and sensuality.